A study in chain forging page 4. Super cells were introduced there, and they weigh in heavily in one early step. 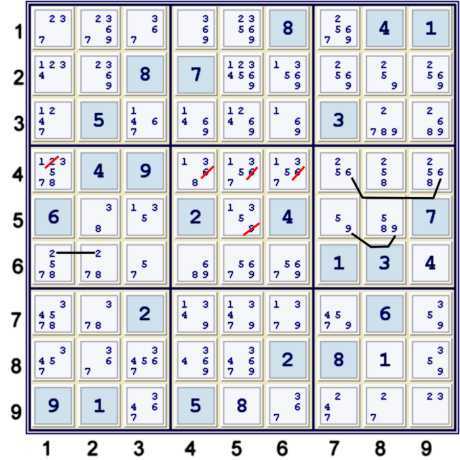 Matrices in Sudoku. Here, one gets the theoretical background for the validity of merely counting. Unique Rectangles. Just a brief introduction. In order to save both time and space, some easy steps may not be illustrated. Also, this solution has not been fully pared for efficiency. However, many steps that I found were superfluous and thus will not be published. The puzzle quickly reveals itself as very difficult. Here I made my standard puzzle mark-up, and found very little. (7)r1c7=(7-8)r3c8=(8)r3c9 forms the Super Cell:(78X)r1c7,r3c89. This means that there is room for just one candidate other than 78 in those 3 cells. Thus we know we have the Hidden Triple (78X) in those cells. We just do not know the identity of X. One can now use this information in a chain. Above I called this super cell - AUR sis combination a Hybrid Hidden Triple. 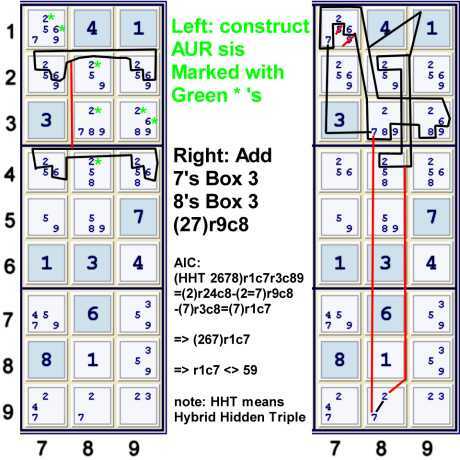 The only problem with the AIC chain shown above is that it gives the illustion that one must consider the strong 7's in box 3 twice. This is just an illusion. It is a function of the vehicle, AIC. However, one can merely count the way to the deduction. The trick here is to remember that all matrix configurations rely upon achieving a nxn matrix. Thus, one need only count matrix columns versus rows. I do not construct the matrix mentally, but rather only keep track of the count. One can always construct the matrix later to convince oneself of a valid deduction. (7)r1c7=(7)r3c8 => 1 row, 2 columns. Thus we have one extra column. Call this +1. (8)r3c8=(8)r3c9 => noting weak link (7-8)r3c8, we have added one column and one row. Thus +0. (7=2)r9c8 => noting weak link, (7)r3c8-(7)r9c8, we have again added one column, one row. Thus +0. Thus, we have added one column and one row.+0 again. Note additionally that (7)r1c7 and (26)r1c7 have potential targets. Move (26)r1c8 into column 1. We have now lost a column. (-1). Total: (0). The counting on such a short chain can be done mentally. With practice, this mental exercise becomes fairly easy. This deduction serves to make this puzzle much easier. However, it still is not easy. Nevertheless, the extreme shortness of the AUR step makes it very attractive, in my opinion. Please note that once one recognizes any sis, one is free to partition it in any logical fashion. This is basically the Useful group concept discussed in Forbidding Chains, the Practice. With AUR sis's, identifying the useful groups is often the key. It takes some practice to realize that since the proven sis are often unusual, the groupings will also often be atypical. However, this is true of any derived sis. This writing is nothing but the recognition of conjugacy between naked and hidden sets. Thus, in my opinion, they must be equally acceptable, even though the latter presentation appears more net like. 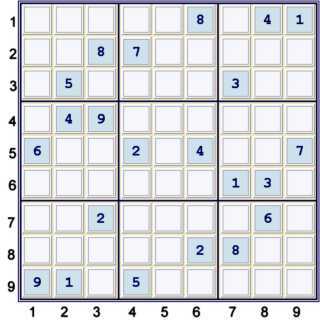 Oftentimes, when a truly difficult puzzle hits a very difficult point, the consideration of Almost Unique Rectangle strong inference sets, (AUR sis), can be a useful tool. Nevertheless, the proven sis can be unwieldy. Recognition of the fact that any logically valid partition of these sets can be used in any logical vehicle is often key to using such unwieldy sets. Oftentimes, just a very little bit of outside the box thinking can provide much utility. One of the reasons that I decided to struggle with the ridiculous puzzle called The Easter Monster was to teach myself some new tricks. The AUR step shown above is a reflection of one such lesson. Fortunately, the deduction was not too complex. This concludes the first page of this solution. Eventually, this link to the next page will become valid.